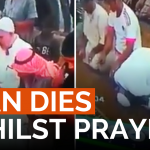 Recently, a video of a cleaner at the Prophet’s ﷺ mosque in Madinah reciting in front of the president of the Haramain, Imam Abdur-Rahman As-Sudais went viral on social media. The video reached millions around the world. Inspired by the video, we put a message out on our social media accounts asking if anyone knew him so that we could give him a gift. Not long after, someone contacted us and gave us his number. 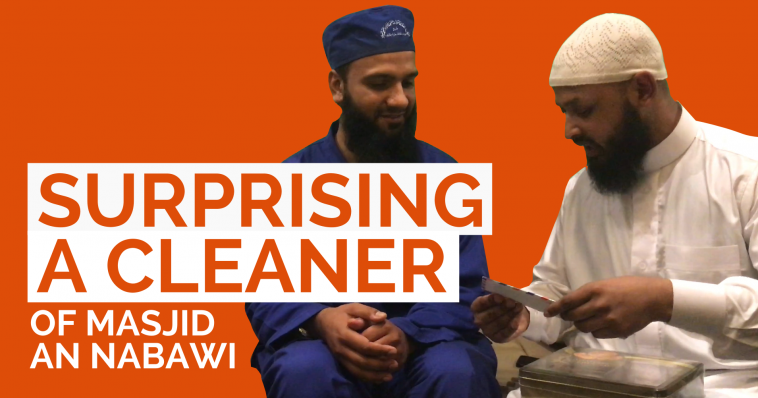 After getting in touch with him, we learnt that he came to Madinah from Pakistan to study at the Prophet’s Masjid (Masjid An Nabawi) and that he was working at the prophet’s mosque as a cleaner in order to pay for living costs and expenses. He also sends money back home to support his family. Touched by his story, we set up a crowdfunding page on Launchgood with a small target in order to help him with his studies. Alhamdulillah, we exceeded the target thanks to the generosity of our followers. A few days later we were able to surprise him with the monetary gift – he had no idea about the crowdfunder! “The prophet ﷺ said: the most beloved deeds to Allah is that you bring happiness to your Muslim brother or you remove his hunger or pay off his debt. Allah is in the assistance of his servant as long as the servant is in the assistance of his brother”. He also said duas from his heart came out when the gift was given. May Allah bless everyone who contributed.